There are all kinds of messes that babies can make. Steven is now of the age of “into-everything-messes”, where you look away for a few minutes and all the books from the shelves have been pulled off onto the floor. Or, at the library, when I go to help one child find the book they are looking for and leave Steven sitting on the floor looking at his book, but he gets to the puzzles and pulls all 20 off the shelves and dumps the pieces out–in the span of 30 seconds. Tonight, he pulled all of the canning jar rings out of the drawer I keep them in. He threw them across the floor. 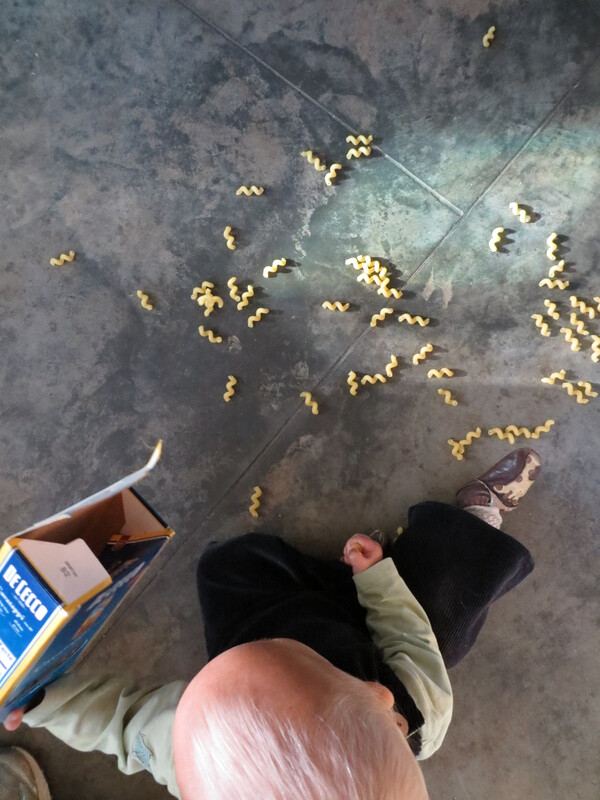 The other day he poured out all the pasta on the kitchen floor from a box he found in the pantry. I sat down with him and showed him how to put each piece back in the box. We worked together picking up each piece of pasta and putting it back in the box. When we put the last piece back in, I felt smugly that I had gotten the mess cleaned up and played a little game with Steven, and giving a little lesson to teach him how to clean up. He immediately turned the box upside down and dumped them all out again. And smiled. I walked into my office on Saturday morning to find what you see below. Steven had pulled out all my notes cards and envelopes. So much fun! 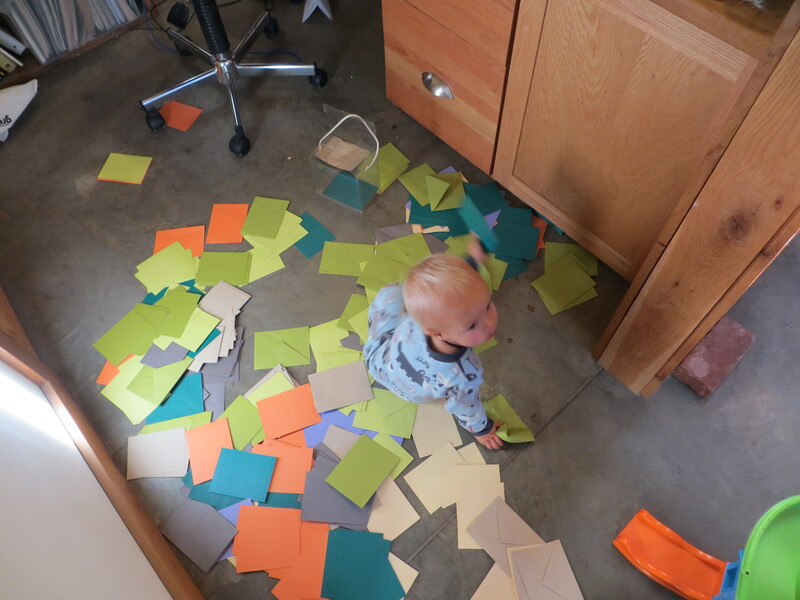 He loved the multicolored paper strewn everywhere! There was no point in cleaning it up till later. I don’t really mind these messes. 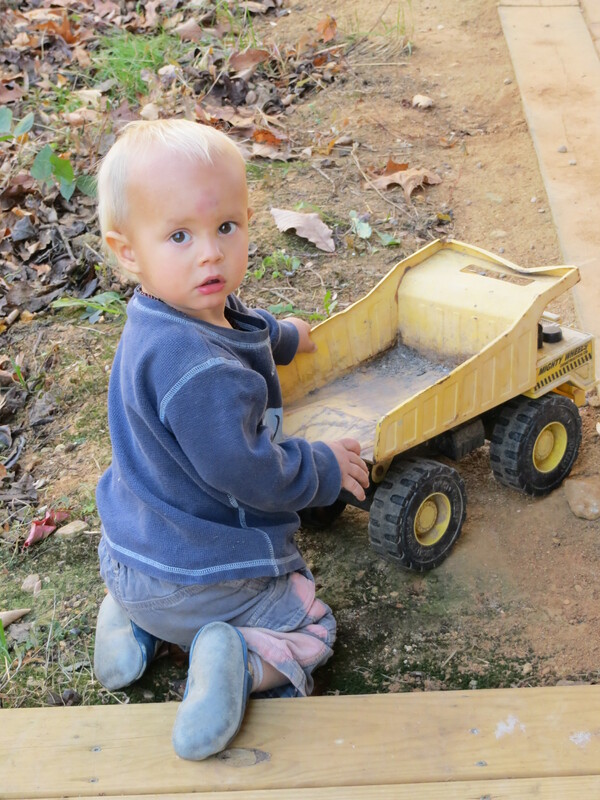 I know he is exploring and figuring out how things work, what things feel like, how they move and go together (and come apart). And, he loves making these messes. When I find him with one, he seems so pleased with himself. They also keep him, harmlessly, entertained. Plus, he is awfully cute!